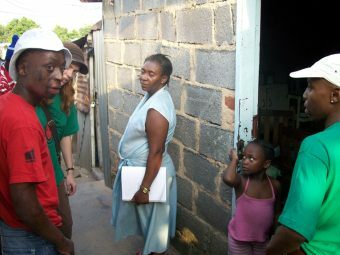 Three UMashesha volunteers – Marietta Neumann, Mfundo Ntamehlo and Musa Zwane - checking names of affected households after the fire in Alexandra Township on the afternoon of 26th November 2008. 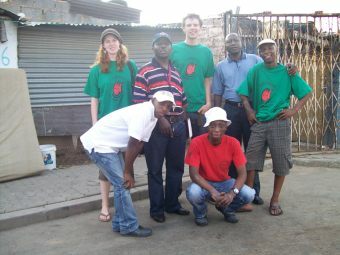 Pictured- some of the volunteers who make up “The Team” here, UMashesha who respond quickly to help people after fires. 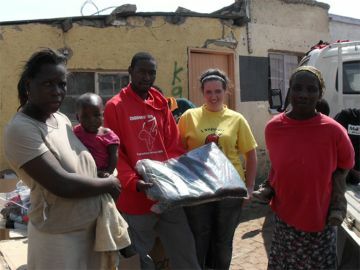 They had just helped families left destitute after an exploding-stove squatter-camp fire on 26th November 2008. 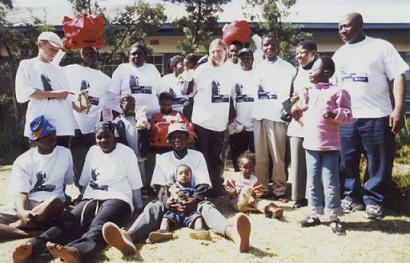 The UMashesha volunteers received free Tshirts from Discovery Health at their monthly meeting in August 2004. 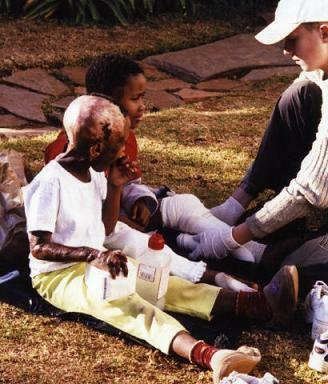 Tristan (13), the youngest UMashesha, bandaging Precious and Zenette van Wykin September 2004, after recent surgery. 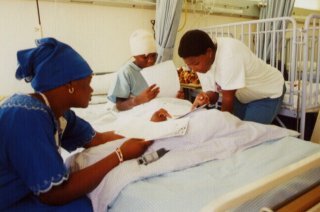 Hilton Kaplan, Dorah Mokoena (10 - needs thumb), Tristan De Ionno, Precious van Wyk (7 needs more leg surgery), Zenette van Wyk (6 needs hand, foot, head surgery), Charmaine Morifi in Auckland Park mid August 2004. 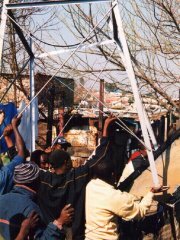 Pointing out dangerous electrical wiring in Alexandra is one of the many tasks that the UMashesha take on. August 2004. Every third Saturday of the month, the UMashesha have a meeting at Alexandra/Wynberg Police Station in Second Avenue at 9am. At the most recent one, the little girl Refiloe Makau who was born without legs, attended with her mother. Due to the intervention of the UMashesha volunteers, Refiloe now has a R620 a month disability grant. She thanked them and was given a gift of some clothes. Having surmounted the grant hurdle, Refiloe is now asking how she can get a bursary for higher education .. and she is only 14 years old! She would also like a better wheelchair. As she is not a burned child, charity funds cannot be used to assist this request. The UMashesha arranged for her to borrow more books from their "library supply" so that she has plenty to read though. Little Babalwa also came to the meeting. She is coping well with her splinted arm and was given a travel bag of clothes and toys by the charity to enjoy while she recuperates from her surgery. 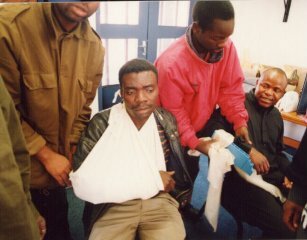 At the September 2002 meeting, a man who had read about the charity in "You" magazine, asked if he could come and demonstrate his safety equipment to the UMashesha. He showed a convex-base stainless steel cooking lid that he claimed could sit on top of any sized pot, and that it prevented hot oil from splashing out. The price of some R185 was too high for people living in squatter camps. (Of this price the inventor claims that he gets R40 and the person selling it can also get R40). He was not prepared to provide samples for the UMashesha to try out. 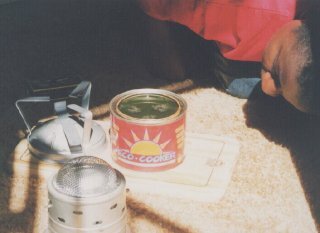 Thomas Ranemane also demonstrated a small "Eco cooker" that he is trying out in his own home. It can be a cooker or a heater, costs about R40 a unit and runs on an ethanol-based gel. The manufacturer has yet to provided full safety data. Separate from the charity, but to assist the volunteers in earning a living, they have set up UMashesha Business. This is headed by Linah Ntamehlo and they are selling candle holders at a small profit but have not yet got to grips with the idea that they must repay the capital that they were originally loaned! Where candle holders are funded by outside donations, they will also distribute them free of charge to people in need. 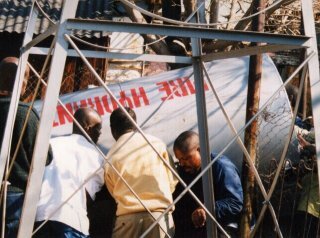 The end of September 2002 saw 15 new people undergo the three day elementary firefighting and fire prevention course in Brixton, Greater Johannesburg. The course was run by Willie Barker and his colleague Gert. Among teaching materials, they handed out the new Learn not to Burn booklet that the City of Johannesburg has produced in co-operation with the SABC. Patricia Kgabi, Rosina Malati, Linah Ntamehlo, Priscilla Hlongwane, Dorcus Botopela, Cylvia Masegela, Clement Steyn, Robert Matlhapi, Essau Ranala, Cate M Mothemala, Siphokazi Petani, David Dikotla are all from Alex while Elsie Sejeso, Busisiwe Nhlapo and Pule Mako are from Joe Slovo squatter camp in Coronation. Most of the trainees had previously undertaken the Children of Fire/St John Ambulance First Aid training course in Alexandra at Alex SAPS on the 17th 18th and 19th of August 2002, run by Patrick Nene. 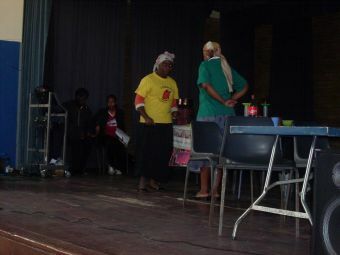 A contract to provide lunch and other refreshments for the trainees was awarded to Mthombeni-Botopela Catering - run by two UMashesha members Elizabeth Botopela and Emmanuel Mthobeni as they managed to quote a lower price than the previous supplier Othandweni (an organisation that trains street youth in baking skills and similar). It was also a way to assist the volunteers a little financially, as it is hard to volunteer on an empty stomach. 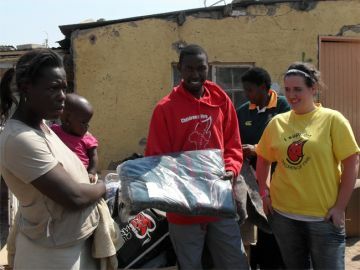 David Dikotla, a recent recruit to UMashesha, is from the squatter camp at 163 Fifth Avenue, Alexandra. More than twenty families in his community lost all their possessions in a fire in September 2002. Some of their problems are detailed on the Appeals section of the website and the community is raising a variety of issues with Disaster Management, as the people are very unhappy with the way they were treated by local government. 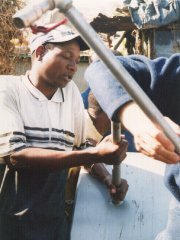 Thomas and Rossinah made contact with the Benoni squatter camps in September 2002 and helped put up a water tank there; Thomas and Emmanuel also took manufacturer Springbok Tanks to see problems with tank installation in Setswetla. Emmanuel accompanied burned teenager Mfundo for his appointment with a surgeon at Milpark hospital. A visitor from the UK (Mike Downes) was treated to morog (African wild spinach) and pap (maize meal) lunch by the charity, with all the UMashesha mambers, cooked in Joyce's shack. Mike's community in Wivenhoe tries to assist the charity in various ways. Four UMashesha team leaders will also move on to St John First Aid, Levels Two and Three, in a seven-day course running from mid October 2002, in Braamfontein, Johannesburg. And between ten and 15 UMashesha members (depending on the size of room we can borrow if the office is too small) will undertake a three day Fire-Life-Safety-Educators course in October 2002. Two other members of UMashesha are also going to start to learn to drive through The Driving School Tel: 011 475 6445, with a view to them being able to proceed on to the 16-week-long volunteer firefighting course run by Brixton Fire Brigade. A driving licence is a prerequisite for this level of firefighting training, but the Driving School www.drivingschoolsa.co.za pointed out that many people in South Africa think that there is a set price for getting a licence to drive and that the school's focus is instead on preparing people to drive safely and courteously, not just to scrape through a test to get a job. The Driving School has also commented on the dire need for off-road training facilities in the Randburg area. There is ample unused space at or near the Randburg Sports Ground but securing agreement from the local council has proved elusive over the past few years. To get them started towards a learner's licence we purchased three books: Pass the Test - Learners at R59.95; Phasa ilenazi yakho kalula R54.95 and Pass your Learner's Licence first time by Struik R34.95, all published by Struik. All UMashesha will learn the theory of driving even if there are insufficient funds to equip them all to take driving lessons. Thanks to Julienne du Toit for her assistance with the UMashesha training initiative as well. Freelance journalist Trish Guy has offered to assist the UMashesha with scripting a drama to make some of their school presentations easier for young children to remember the key points. A core of UMashesha volunteers have built up good team spirit and maintained momentum in the township by preparing a safety presentation to schools (e.g. Ithuthe Primary School) and community centres (e.g. St Mungo's Church), given mainly in a mix of English, isiXhosa, Sesotho, Sepedi and Tsonga. They demonstrate how to stop, drop, and roll and how to protect one's face with one's hands; how to wrap someone in a blanket or coat who is burning, to try to save them from injury; the dangers of putting too large a pot on a primus stove; the potentially-lethal curiousity of toddlers with hot water; why worn electric cables are dangerous and why irons and similar electrical equipment must have an earth wire; how to drag an unconscious or injured loved one out of a building in a blanket; what to do if a child drinks paraffin; how to cut a plastic cold drink bottle to make a funnel for safer pouring of paraffin; use of a paraffin safety cap .. how to obtain them .. and why cold drink bottles should be labelled with a paraffin sticker if they contain paraffin; safe candle holders filled with water and an ethanol-based "Eco Cooker"; how it is hard to see when a building is full of smoke (putting blindfolds on some pupils); and much much more. Boveti Primary School 011 882 1352. Principal: ME Nkuna; contact teacher MN Coza. This presentation was given largely in the Tsonga language but the problem was that the UMashesha were asked to teach 900 disruptive pupils, spread across a wide age range, all at once. 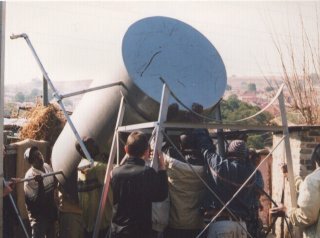 The performance of Sept 17th 2002 will be repeated for smaller groups, arranged by Jimmy Mathye and Emmanuel Nthombeni. Ikage Primary School 011 443 2712. Principal; Mrs Mathebula, Deputy: Mrs Rankapule. This performance was on Sept 19th 2002 and went better than that at Boveti, as not only was the group being taught a more manageable size, but the teachers also maintained better discipline. The language used was largely Sepedi. Having all the pupils outside in the hot sun was not ideal, and where possible, use of a raised seating system (like the embankment used at Ithuthe) allows pupils to see more easily. The children love the chance to be involved in activities like stop-drop-roll but become unruly when they clamour for the chance to participate. Inkanyezi Waldorf School 011 443 0263/443 5355.There was no principal at this private township school. The pupils were reasonably behaved and watched the performance inside a school hall. At the Ithuthe Primary school Mfundo Ntamehlo, age 16, introduced UMashesha to four other burned pupils: Sananeliswa Mdodoa, age 16, Mosa Zwane age 12, Bongi Mgibidi age 13, and Mosa Qolo age 14. Alex Fire Brigade assisted with this presentation. Some of these children will attend a "fun day" at Roodepoort Fire Station in October and some will be filmed for MNet Cares on October 9th 2002. They were all given toy trucks donated by supermarket chain, Pick n Pay (and sourced by Triple A students). The charity will arrange for one of the boys to have surgery to reconstruct his ear. 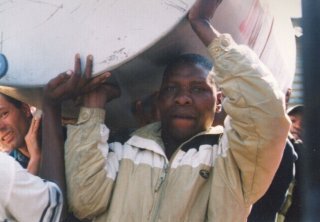 In a different part of Setswetla squatter camp to the area ravaged by Winter 2002 fires, the volunteers carried in water tanks to try to prevent fire damage and burns injury in future. 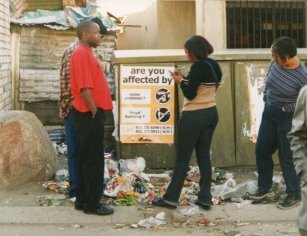 And in late July 2002, two UMashesha members started job-shadowing with the Environmental Health section of local government Region 7, as environmental health hazards are significant throughout the township. It took a fair number of meetings to fine tune the legal issues of indemnity forms and similar, but the initiative is now working well on a rotating basis... even though the UMashesha pointed out early on that there was a blocked drain outside the environmental health offices that needed to be tackled as a priority! . This was fixed some weeks later after several reminders from the UMashesha. The job-shadowing will continue over the coming months with two volunteers at a time. The same process is expected to start with the Social Work department after Children of Fire gave its presentation to Alexandra Social Workers on August 13th, 2002. There will also be a joint initiative with City Power. While the utility is gradually providing electrical connections across the township, the UMashesha want to deal with a danger even if it exists just for one day. 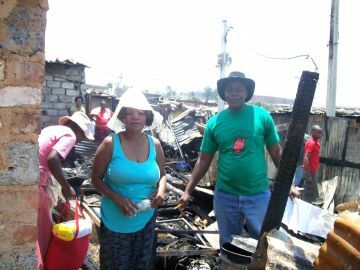 Some of the volunteers, particularly Linah Ntamehlo (also called Mamfundo) and Thomas Ranemane, have worked long hours supporting the community of Setswetla after 56 families lost everything in a July 2002 fire. 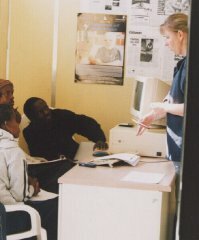 And in July 2002, the UMashesha started getting training for a small nucleus of members in computing skills, thanks to the kindness of Lisa Hutchinson. They will have their examination on October 9th and then, we hope, another group can start trainig as well. 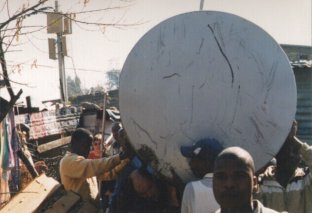 An UMashesha focus on illegal electricity connections in June/July 2002 and the high risk of fires and burns as a result, was covered in local newspapers The Saturday Star and the Sandton Chronicle but none dared carry the call for old garden hose to be donated to better-insulate illegal connections. 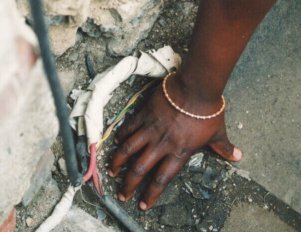 Children of Fire emphasised that it was not trying to encourage the widespread illegal practice, simply trying to minimise the number of children suffering horrific injuries like the loss of hands through electrocution. Trying to motivate City Power to be more proactive is not happening quickly. 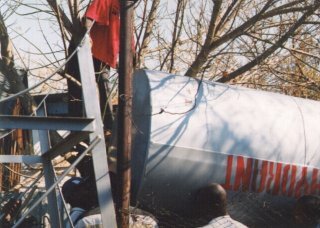 After informing them of a dangerous, open, distribution box - at toddler height - off 8th Avenue in October 2001, City Power had STILL failed to rectify the problem by September 2002. However a positive meeting was held with Franse Matinketsa in September and his colleague Ernest Sepharama 083 703 2590 is to discuss job shadowing. 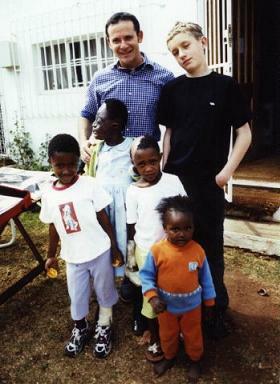 Following a request from Daniel in Brits (who saw the charity's work described on ETV's Felicia Show), Thomas visited the community north of Pretoria to assess their training needs and the possibility of assisting them, during August 2002. TV helps awareness and the UMashesha have already been filmed at work by Japanese and German television channels. 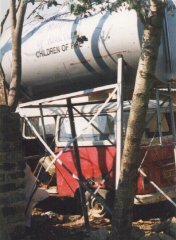 Finally, Veronica Dyde, UK-based trustee of Children of Fire International, has had talks with officials in Southwark, London, to see if there is a way the Warden Scheme can assist the UMashesha. The idea came about because of the increasingly frequent links between Alex police and Southwark police. The Warden scheme in London is a little like UMashesha, but they are paid salaries by the local council - a good idea for Johannesburg to emulate. 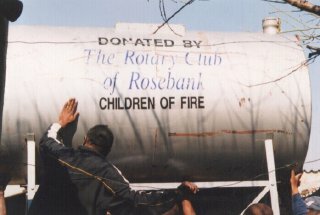 In September 2001, Children of Fire's frequent work in Alexandra and the death of three* children in particular, led us to further investigate the root causes of fires in the severely overcrowded township of several hundred thousand people. Alexandra is some 16 kilometres from Johannesburg and is an extremely poor area almost adjacent to the exceptionally wealthy Sandton area. The World Summit on Sustainable Development is being held in August 2002 in Sandton. *Sadly a fourth child -- a little girl called Yolanda -- from the same family died from her burns injuries, a year later, in September 2002. The fire on September 14, 2001, near Third Avenue and Selbourne was preventable. A man seemed to have a nervous breakdown that led to a fire being set; compounding that, the nearest fire hydrant had been vandalised by scrap metal thieves, and so the fire could not be extinguished quickly. Prevention had to be a better answer. In fact it is worth noting that in early 2001, the highly respected British Medical Journal banned the word "accident" - not just from "linguistic neuroticism" as the Financial Times called it, but also because most accidents are predictable and preventable. At the same time in September 2001 we had been talking to sign writers about making a permanent sign to put on people's doors, to identify a quick helper within. For a long time we had been placing the large St John Ambulance stickers on shack doors, identifying a person inside who had undergone first aid training with us to help their community. But this did not sufficiently describe the person inside if she or he had also undergone fire-fighting training and maybe had other community skills too. We considered a variety of titles but they either sounded militaristic or religious or political. Then Roy, a kind sign writer at R&R Signs and his colleagues in Fordsburg, Johannesburg, came up with the idea of UMashesha (oo-mash-shay-sha). It was apt (quick helper/mover), African (Zulu) and easy for non-Africans to say and to remember as well. The essence of the idea is as follows: We are trying to sensitise people about avoidable danger and to get them to look after themselves and their community. After training people in first aid and in fire fighting/prevention, we envisage them learning further skills that would effectively make them public educators and community safety workers. This creates a new career for high-commitment high-calibre people, somewhere between disaster prevention and management, emergency services and social work. If all those fields worked at their optimum in South Africa there might be no need for UMashesha, but those professions don't seem to work as they should. They are often under-funded, understaffed and certainly under-skilled, but those are not the only reasons for their inefficiency. As an initial programme, the UMashesha could tackle each Alexandra avenue, for, say, a rolling twenty week period, working Tuesday to Saturday at urban piece-job rates for maybe R80 a day. To help them take the work seriously, two days out of every five days' pay would be put direct into a bank or post office account and written into a book that they would only receive six weeks into the programme. The UMashesha would be a badge of honour received after at least two courses and a 20-week working period. As the team went down each avenue they would identify and maybe fix damaged fire hydrants themselves. Complicated maintenance or vandalism would be written up and faxed and phoned to the appropriate contractor the same day. The government department or private contractor would usually get three days to fix the problem. If it was not fixed, the same report sheet would be re-faxed to the original recipient and also to her/his supervisor. If there was no further response in the next three days, the document would be re-faxed to the person with responsibility at provincial or even national level and also to the media, explaining how lethargy was a major public health hazard. 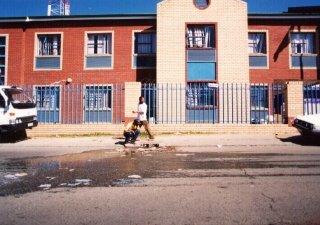 The UMashesha teams would be given pots of yellow paint to freshly mark each hydrant. Around each hydrant they would call a public safety meeting for, say, half an hour. This would deal with such topics as clean water and why not to take water out of the drainage system; how the fire hydrant is there to save their lives and to which telephone numbers they must immediately report vandalism; the dangers of stealing electricity and putting cables across the streets or "borrowing" electricity from neighbours through the use of several extension cables. The UMashesha could also give people information on clinic opening times, assistance with vaccinations, Aids medication and explain what other medical help is available; as well as how to access the child support grant, and other grants. A bit like the Government's Working for Water programme, this could become a significant employer of the poorest of the poor, empowering and educating, saving lives and, in the end, saving local or national government substantial sums of money - a stitch in time saves nine. It would take a lot of mentoring and organisation and would require effective swift response from parastatals like Eskom in some areas, or the municipal buyers of electricity like City Power. The pilot programme would like to employ four people for a year to manage most of the project and for us to be able to contract St John Ambulance to run one course a month at some R500 a person for 16 people per course to teach people St John's level one first aid. (1 to 12 courses during 2003). We would like the emergency services to arrange a full 3-day fire fighting and prevention course for 20 people (primarily the cream of the first aiders) every two months i.e. six courses during 2003. The four people managing the UMashesha should have a fixed salary, a system of bonuses, a cellphone that they could retain at the end of the year and sufficient phonecards/controls to ensure that they could always be in contact with a main office or the Emergency services. 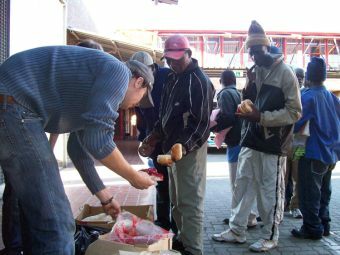 Each of the four people should undergo self defence training before starting work, in recognition of the particular difficulties of working in Alex. The cost of the four people could be, in total, some R24000 a month and they would be selected by Children of Fire. This idea has been given in writing to Strike Ralegoma, a Johannesburg councillor who is meant to deal with public safety and security, and he indicated that a once-off grant might be available but that running costs would not be met. Running costs are the most important element as volunteering cannot work long on an empty stomach. The UMashesha would report electrical hazards and general fire risk. They would explore re-housing options (as a source of information to people) to try to decrease the lethal overcrowding where conventional house backyards are full of shacks. They will note environmental dangers such as piled up waste and hazardous waste, rat infestation and sanitation (or the lack of it). Many parts of Alex are still serviced by portable/chemical toilets despite there being mains sewerage available across most of the township. Many large drains are open where children could fall in. The teams would stop children of school-going age if they see them out and about in school hours and determine why they are not in school; if need be they would negotiate with principals for admission of such children to schools free of fees and Children of Fire would seek external assistance for uniforms for a limited number of children. They would look at health and mental health of the people out and about in Alex and try to find safer havens for the most mentally-disturbed. The UMashesha would notice shebeens but not attempt the role of the SAPS nor even of Police reservists, but look at them from the point of health and safety and consider ways to ease dangers by, e.g. voluntary shortening of opening hours of such liquor outlets. The UMashesha would note the main outlets for stolen metal - where it impacts on public health and safety (as with telephone cable theft and fire hydrant component theft) and suggest solutions to law enforcers. 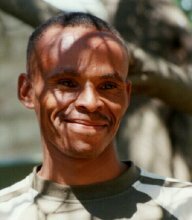 In August 2002 there were three UMashesha teams of volunteers headed by team leaders and headed overall by Thomas Ranemane. He has been supplied with a cellphone (082 391 3698) on long-term loan by Children of Fire and limited assistance with call costs and travel costs. 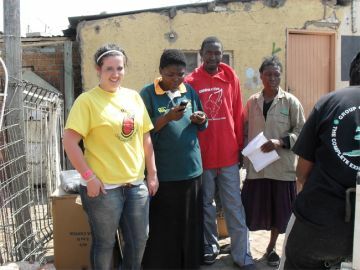 Another team leader, Elizabeth Botopela, also has a cellphone on long term loan (082 396 8029). The charity is renting an office (no 212 on the second floor) in the Prosperitas building in 4th Street, Wynberg, immediately adjacent to Alexandra. The building is well known locally, as it also houses the Armsta taxi association. There is a storeroom in which donations of second hand clothing are kept to help people after fires or the families of burns survivors in need. 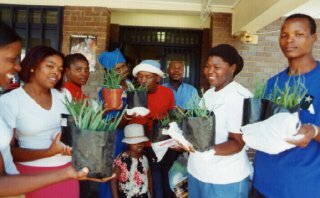 They also store LoveLife newspapers (primarily covering HIV-Aids and other health issues) to hand out when visiting schools on safety training days, as well as some Gauteng Province colouring in books for children with fire/safety messages and a small number of Sipho's Story (Soul City comic books) about fire and paraffin safety. The volunteers are equipped with a double hotplate, coffee, tea, soup and sometimes bread, within a small budget managed by Thomas Ranemane. A small group of them are being given lessons on a donated computer (given via St Mungo's church, Bryanston) and there are also two old electric typewriters donated Niva Waldeck, though one of them needs attention to get it working. 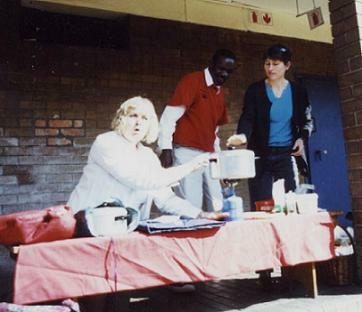 Thomas Ranamane and Elizabeth Botopela visited Councillor Christine E Walters in the community development office the Civic Centre in Braamfontein, Johannesburg.on Monday February 25th, 2002, following a meeting a month before with Strike Ralegoma. They had hoped to link again with two people from Joe Slovo camp but failed to meet up with them. They discussed about the operation of the project mainly in Slovo and Alexandra. There are eleven regions in Greater Johannesburg of which Region Four includes Joe Slovo squatter camp and Region Seven includes Alexandra. Ms Walters suggested more formal links with ward committees, ward councillors and sector NGOs, but was told of the problems with uncooperative councillors in some areas and non-functioning ward committees. The UMashesha requested all relevant contact details and maps of wards. The civic centre said it might help UMashesha with rates and rebates every year if an office is established. Thomas was not clear if a rebate meant it must be paid in advance and claimed back or that no rates will be due at all. Another UMashesha team leader Linah Moselakgomo has approached burn survivor Mfundo Ntamehlo's school principal about the idea of an UMashesha youth programme. 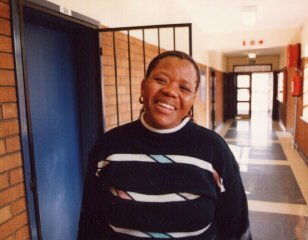 Both she and Mfundo (see elsewhere on website) went to talk to the principal of Ithuthe Primary School, 11th Avenue, on Tuesday March 5th 2002 who said he'd raise the matter at a parent/teacher meeting in April 2002. Linah is looking at schools near key streets and at an awareness programme for schools on burns. Trainee Anna Ndlovu a teacher of Standard Six pupils at Realogile School, promised assistance with environmental health contacts, but she seems not sufficiently interested to remain an UMashesha member. Elizabeth Botupela agreed to go and collect syllabus and course notes for the new (April 2002) safety programmes in Alex schools, to see how the UMashesha can contribute. Another two UMashesha members agreed to approach the Environmental Health section of Region 7 and ask if UMashesha members can, one at a time, spend a week job shadowing, to get an idea of what they do and can do, (for a six week period initially). Thomas met with Doris, the fire chief of the Alex fire station. She intimated that pressure had been put on her after Children of Fire raised awareness about the massive problem of missing fire hydrant parts. Thomas explained that the charity had a problem with no communication from David Thembe, op. Fire chief and Hillow Maeko, disaster management, but that the issue was being tackled at higher levels. Trainee Zolile has established links with Bomba of the monthly newspaper Alex News to publicise the UMashesha project, and is looking for a weekly slot on Alex FM. Trainees Protus and Bukiwe have met with social workers in Oliver Tambo Centre in 1st Avenue, Wynberg, to see how UMashesha can assist them. While links to Region 7 of Johannesburg City Council (011 531 5500), the Alex Police Station remains an essential part of the UMashesha project and the key contact there is trainee (and Domestic Violence Unit officer) Dinah Matlapeng. Station Commissioner Director Mothibe is also keen on the project's success. Each UMashesha team leader has been equipped with a laminated identification badge and also has, or will have, an individual first aid kit donated by children in Wivenhoe, Essex, UK. The team leaders deal with group issues of mutual respect, co-operation, and language, and Thomas has a full CV for each group member. 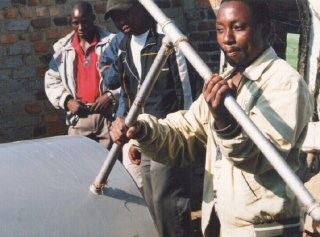 We would be very happy for other groups of volunteers and safety workers in Southern Africa to copy any of the UMashesha ideas and to contribute their own thoughts to the project. Rubbish is everywhere in Alex - it is collected twice a week but the population density is simply too high and daily collections are needed. 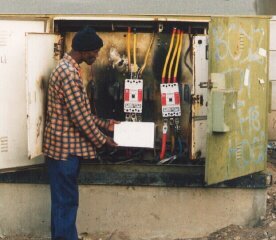 Thomas Ranemane inspects a dangerous box off 8th Avenue, Alex. 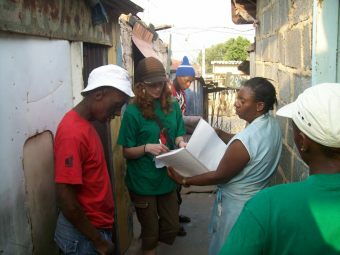 July 14, 15 and 16th 2001 saw Children of Fire's first foray into training squatter camp communities in Alexandra Township in First Aid. Helped, as in all previous similar training endeavours, by St John Ambulance, the trainees were largely selected for the course by Collen Mudau. Collen has helped us for some time. He himself lives in a squatter camp and has undergone two training courses with Children of Fire. The ideal mix of trainees should be about five in their 20s, five in their 30s, five in their 40s and five in their 50s. We have found it very hard to get capable people in the older age brackets and even in the younger age band, many people have very limited literacy. We insist that they must have at least Grade 7 schooling to enrol. People do not pay for their training but they are expected to put something back into the community afterwards. The trainer is Petty Ndaba. Because many of the poorest people are demoralised, we take on more people than we expect to turn up. Even then, some people fail to arrive on the second day of training. On this course the trainees are: Phindile Khumalo, Daphney Mohlala, Nompumelelo Mthethwa, Owen Mugari, Stephen Thantsha, Charles Matlala, Anna Ndhlovu, Rodgers Chauke, Lawrence Nobela, Jimmy Mathye, Emmnuel Mthombeni, Christopher Baloyi, Stanley Chauke and Dinah Matlapeng. Dinah is the first member of the South African Police Service to be trained by Children of Fire. She is 36 years old, from Rustenburg and the mother of two children. She took a break from active duty to do administration work, but is now returning to the beat with her new-found first aid skills on top of all her previous training. 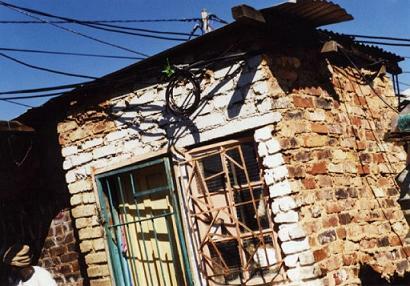 Most of the trainees live in shacks. When not training, they discuss their living conditions and potential solutions to the everyday dangers that they face .. like an aluminium paraffin lamp that extinguishes itself if it falls over. The idea to train a policewoman was to start bridge the divide between the community and their long-held perceptions about the South African Police Service. Policemen/women are not allowed to transport injured people in their vehicles - in case they die en route. But the police often arrive at a site two hours before the ambulance does. As more and more police are trained in first aid, maybe even sections of the Police Act will have to be revised.